Practicology & TranslateMedia release research identifying localization opportunities for global online retailers. Cross-border eCommerce has always been a major challenge for brands and retailers. This report shows that while global retailers have invested heavily in localization and have largely succeeded in presenting users with content in their own language, there are still many opportunities available to increase visibility and improve the customer experience in some of the major eCommerce markets around the world. 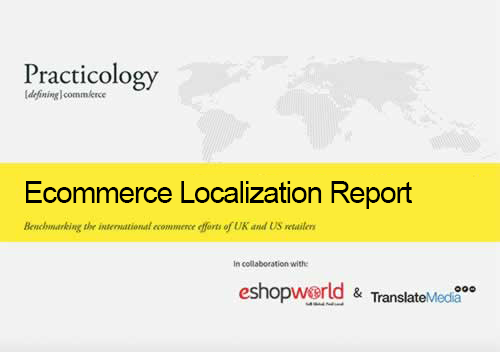 The report analyzes the approaches to localization for 51 US retail websites in Australia, Japan, Mexico and for 42 UK retailers for Australia, France, Germany and the USA to see how the approaches differ between the different countries, cultures and languages. The report assesses UK and US retailers’ localization efforts in a number of areas including: use of language across the site, merchandising and offers, mobile optimization, search engine optimization, social media, customer services, delivery and returns, pricing and payment. Simply fill out the form on this page to download your FREE copy of this report and start applying best practice website localization techniques and processes for your organization’s translation projects.